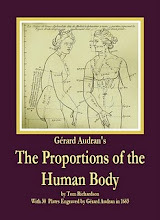 From the text, "Your first care in drawing hands associated with the head or figure should be to make them, proportionately, the right size; and, with beginners, this instruction invariably resolves itself into exhortations to make them bigger. Regarding them, I must suppose, as an insignificant detail, the novice always makes the hands (and feet) of his figure drawing much too small; or even neglects them altogether." 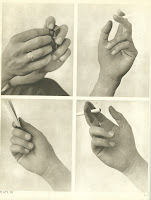 of hand drawing instructions from the 1940s and 1950s. From John Moranz' Mastery of Drawing. The original of this book was an unusually complete book about drawing, 399 pages including animals, people, illustration for advertising, perspective, hands, feet, heads, and expression. It included color reproductions of figure paintings, one of which was reproduced on the cover. 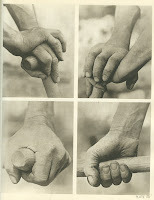 There is a new Dover reprint of John Moranz' book, Drawing and Illustration: A Complete Guide, available at Amazon.com. Cover of new edition, old cover. Drawing and Illustration, by John Moranz.
. Willy Pogany's book has fewer illustrations than the Moranz book, but in its own way is just as complete, plus he has a thoroughly authoritative line in his drawings which you can see in the examples of the hands above. Drawing Lessons by Willy Pogany, take a look at the book at Amazon.com. 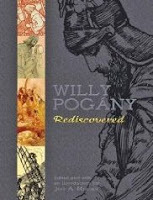 A new book is about to be released Willy Pogány Rediscovered . Other posts about drawing hands.